4. Spyware is a type of malware that will spy on your activities. Most spyware will log all your keystrokes, will capture screenshots, and sometimes will even record videos of your activity! Then, all this data is silently uploaded to the hacker's server, being ready to be filtered, and then used against the victim. 5. Adware is often bundled with free software, displaying unsolicited ads on people's computers. 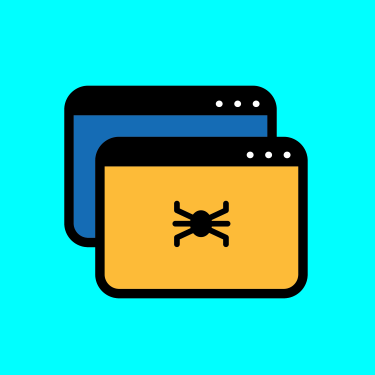 This type of malware achieves its goal by hijacking the browser's home page, changing the default search engine, installing undesired browser extensions, and so on. 6. Ransomware will encrypt the user's data, and then ask for a ransom. A red pop-up will be displayed as soon as all the files are encrypted. According to its text, the hacker will send the victim a data decryption key once that the money arrives in his or her account. Most of the time cyber criminals will just take people's money, though. So, you can see that we're talking about a great variety of cyberthreats. In fact, there are even more, but the ones above are the most frequent ones. To stay safe, you will need to install an anti-malware application. Most top of the line antiviruses include anti-malware modules these days, but you can also purchase dedicated malware removal software. Windows Defender, which comes bundled with Microsoft Windows, is a decent anti-malware application, especially when you combine it with the free version of MalwareBytes Anti-Malware, for example. If you run a small business, you owe it to yourself to invest in a good, paid antivirus. My recommendation is to pick either Kaspersky Antivirus or Bitdefender, which provide full system protection at an affordable price. In the end, don't forget that even the best antiviruses may make mistakes. They may flag clean files as being infected, and infected files as being clean. This is why it's mandatory to back up your devices regularly. Fortunately, most OSs include powerful, and yet easy to use system backup tools.